Fantasy novels have traditionally been built on a medieval model. Even where there are no elves or dwarves or orcs, there is always plenty of swords and horses. This goes to Asian-based fantasy also, often based on mythology it will be full of bows and arrows and dragons. Urban fantasy seeks to move away from these tropes and locate fantasy in more of a contemporary frame. There are plenty of great authors working in urban fantasy – writers like Ben Aaronovitch, Neal Gaiman and Angela Slatter. And now, joining them, from a more Asia-centric approach is debut author Fonda Lee. 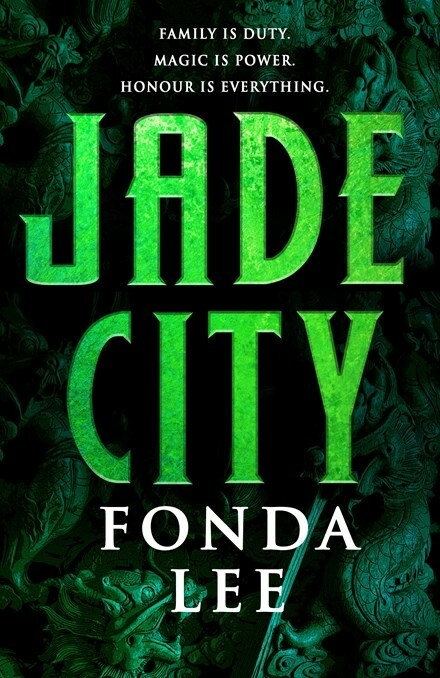 Jade City is set in a fantasy but recognisable Earth. It centres around the island of Kekon where the indigenous inhabitants are able to harness locally mined jade to give them a range of powers. Use of jade is dangerous and training is required to effectively harness and control the power. The island itself is only a generation after the inhabitants successfully repelled an occupying force through guerrilla action, and still the eyes of the two great powers of the world are on Kekon. But this is not a story of that global conflict. Jade City focusses on the power struggle between the two top criminal gangs – the No Peak Clan and the Mountain Clan – for control. Lee’s, and the readers’ sympathies, lie with the No Peak Clan, run by the two grandsons of its founder, a hero of the war, and under serious, coordinated attack from their competitor on a number of fronts. Fonda Lee has deliberately set Jade City in a 1970s-style period. And she bases much of the action and manoeuvring on kung fu-style action movies of the period, with a mix of other influences as diverse as The Legend of Korra and The Godfather. Jade City starts slowly, there are a lot of point of view characters to introduce and a complex social and political culture to get across. But once the pieces are in place and the action heats up the story becomes compelling. And Lee, as with many writers since Game of Thrones, is not afraid to kill important point-of-view characters, setting the story on its ear and upping the stakes. Jade City is the first of a series and while it mainly remains local to Kekon’s capital city Janloon, there is a broader world that Lee references and hints at throughout the book. So there will be plenty of opportunity for Lee to expand her world in future installments.